What is bulgur wheat? Bulgur wheat is a whole wheat grain that has been cracked and partially pre-cooked. As a whole grain, it is a naturally high-fiber, low-fat, low-calorie vegetarian and vegan food ingredient. In other words, bulgur wheat is cracked and pre-cooked wheat (as opposed to wheat berries, which are the whole, un-cracked and uncooked version, and freekeh, which is young green wheat which has been cracked). Because it is wheat, bulgur wheat is not suitable for those on a gluten-free diet. Though bulgur wheat is most commonly found in tabbouleh salad, you can use it just like rice or couscous, or any other whole grain, such as barley or quinoa. Instead of rice, try pairing your favorite vegetable stir-fry or vegetable curry with cooked whole grain bulgur wheat. Or, try one of the easy bulgur wheat recipes below. Watch Now: What Is Bulgur Wheat? Different types of bulgur wheat require different cooking times, so it's best to check the package instructions for cooking instructions. One advantage of using bulgur wheat is that it has already been partially cooked, so it can be quick and easy to prepare at home, and it's much quicker to cook than other whole grains. Most types of bulgur wheat will be completely cooked in less than just fifteen minutes. There are two main kinds of bulgur wheat: Instant bulgur wheat, also called fine-grain bulgur is common in health food store bulk bins and is usually used in tabbouleh recipes. This type of bulgur cooks in less than 5 minutes. Medium grain and coarse grain varieties of bulgur wheat are also available. Nearly all health food stores stock bulgur wheat. Look in the bulk foods section, or in the baking aisle with other whole grains. If that doesn't work, check the cereal aisle near the oatmeal and breakfast grain cereals. Occasionally, you may spot bulgur wheat in the international foods section, near the hummus and falafel mixes, since bulgur wheat is common in a variety of regional Middle Eastern foods. If you can't find bulgur wheat in the bulk section, cereal section, international foods (since it's often sold next to the Middle Eastern foods) or baking section, ask the staff for assistance. Wondering just how healthy bulgur wheat is? 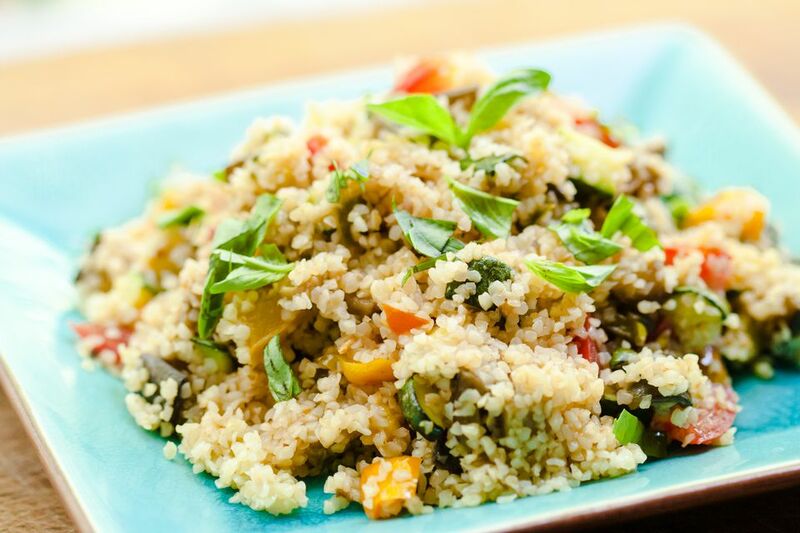 According to CalorieCount, one cup of cooked bulgur wheat provides 151 calories, 0.4 grams of fat, 8.2 grams of dietary fiber (that's about 33% the recommended daily value), and a healthy 5.6 grams of protein. Bulgur wheat is naturally cholesterol-free food.